The original idea for the video actually dates back to 2008 when the three members of &U&I were in a band called Blakfish. However that idea never materialised, until mid February 2015 that is, when I was contacted by the band asking if I was interested in producing a video for their new single - The Stamp. A couple of days later we met up for a few drinks to discuss ideas. The one big obstacle we had to overcome was that it would be near impossible to get all three members together at the same time (due to work commitments etc) by the time they needed the video ready for release. So with the old Blakfish video idea in the back of my mind, I told them of my idea of puppets which fall apart by the end of the song and showed them some concept art. The band instantly loved the idea, and with that I sourced all the materials I needed - cardboard, felt, old clothing, wool, ping pong balls and paint. 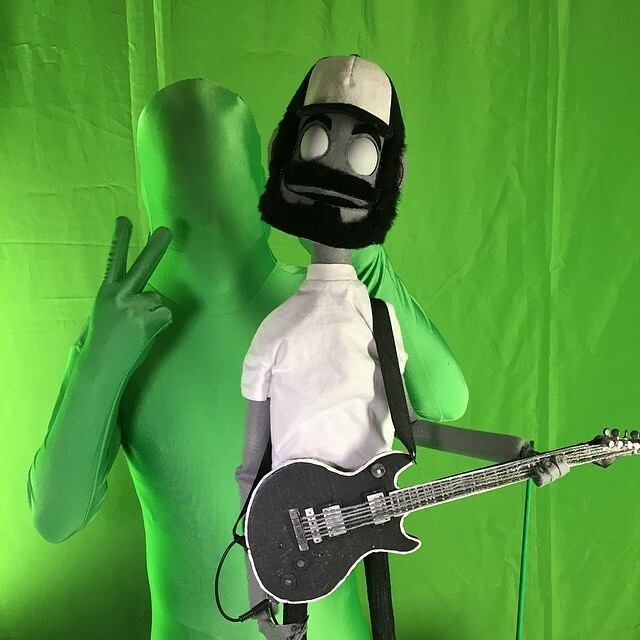 First of all I got to work on making the bodies of the puppets, so that I could make sure they worked and would be robust enough for the video shoot. Before I clothed/skinned them I produced several test videos, one demonstrating how the puppets would work, and then another with various lip sync techniques. 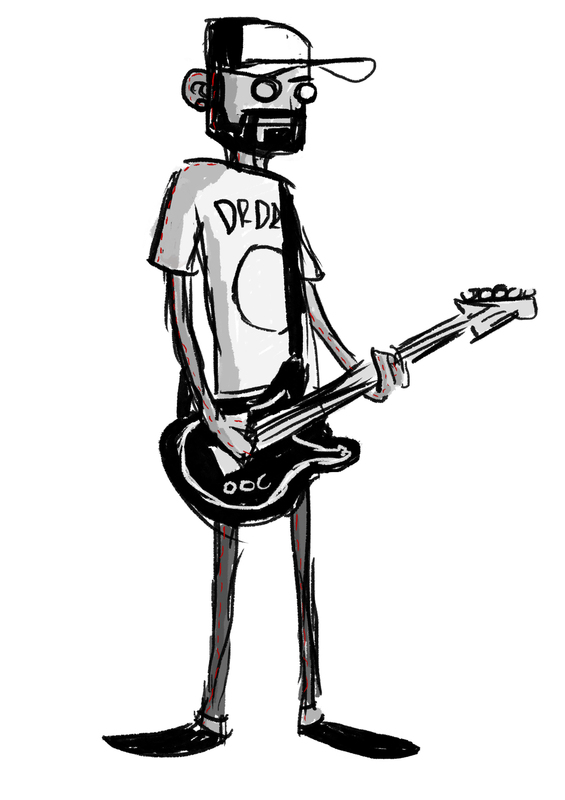 So if the band weren't happy with anything I could course correct myself before fully committing to anything. As you can see we went with the third option. Once I knew the band were happy with how it was all progressing I started to skin/cloth the puppets. As we were going for a monochromatic look to the video (with hits of red ) I thought it would be best to make everything using blacks, whites and greys. With the assistance of my sister - Leonora Whitehouse (who is amazing at needle work) the puppets were completed in little over a week. The instruments/amps/pedals etc took around a week to make. I made two versions of the guitar and bass ( after I realised the originals were far to small) and were made mainly out of cardboard, wool - stings - the machine heads. The drum Kit took the majority of the time (3-4 days) and was made out of cardboard, 18ft of dowling, plastic dinner plates, and plant pot trays. The video itself was filmed over the course of a week, with each band member pupperteering themselves in the hopes that their personality/trait's would come through. The puppets of Thom and Rich took three people to operate, one for the head/body (wearing a green morph suit) then two people either side operating the hands. The puppet of Wiz, only needed two, one for the arms, one for the head/body. I also had additional help from Rob Laity and Rich Howell, who helped film reshoots/pick up shots for the video. 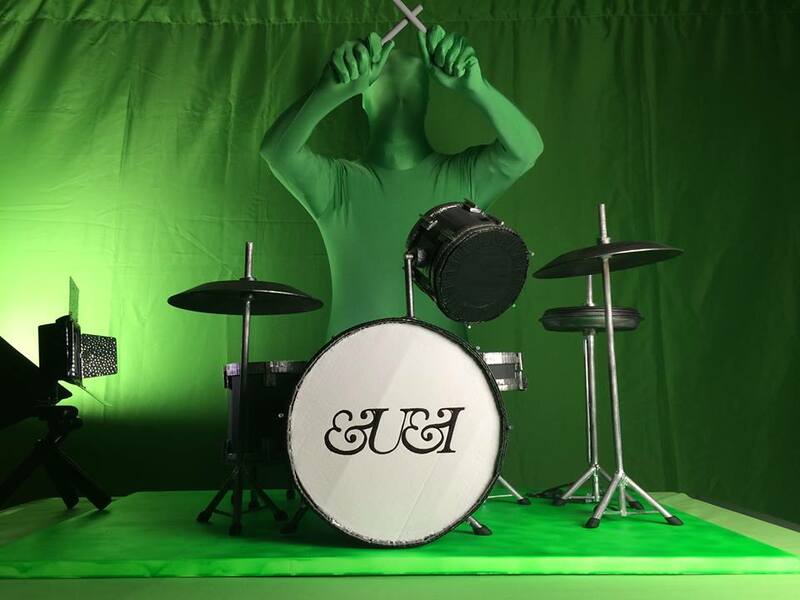 I decided that shooting the video on Green Screen would be for the best for several reasons. 1 - To puppeteer three puppets at once would have been a nightmare, not to mention we didn't have the space (it was shot in tiny bedroom) by shooting them separately I could combine them together in post production. 2 - I wanted to make the puppets really skinny, and to look as if they held up themselves. Most puppets/muppets heads are articulated via a arm going through the body up through the neck and you only see them from the waist up. If you have ever seen &U&I live, you will see they are a really energetic band, and I wanted their puppet versions to be equally as lively and entertaining. Editing took over three weeks, with the bulk of the work being done on after effects. Cleaning up any dodgy green screen shot (which was most of them), compositing the band members together into the same shot, blinks, wire removal and adding in the background elements. All in all I think it was six weeks well spent and I hope you enjoyed the video as much as I did making it. It was a video that I have been itching to make for over seven years and I am glad I'm finally got to make for such an awesome band/song. Big thanks to the band, My Sister (Leonora Whitehouse) Rob Laity, Richard Howell and my Mum...for all the tea. Check out the gallery for more behind the scenes pictures from the making of the video.